My uncle David was diagnosed with HIV in June 1987. The AIDS epidemic had been raging in the United States for a full seven years, but President Ronald Reagan had only just delivered his first speech on the subject the month before. His Vice President, George H.W. Bush, had been equally silent. In that time, some 50,000 cases of AIDS had been reported, and 23,000 people had died — all totally unacknowledged by the highest office in the land. It was a dismal response to one of the worst public health crises in American history, but it didn’t seem to hurt the Vice President’s political career. Bush, who died on Friday at age 94, was elected with ease to the White House in 1988, where he remained until January 1993, having presided over four of the most deadly years of the AIDS epidemic. Four months later, on May 24, 1993, my uncle David drew his last breath in a San Francisco hospital. He was 37 years old. It’s an interesting concept: the idea that all humans are entitled to a period of respectful mourning after their deaths in which we all agree, regardless of what transpired during a person’s life, to speak no ill of the dead. Think of their loved ones, this argument often goes, and their pain in this time. Criticism in the wake of a person’s death — even if they were a world leader — is often described as grave dancing, insensitive to the family’s grief and mourning process. And yet: for every critical piece published in the media over the weekend, reminding readers of the former president’s record on AIDS, the Iran-Contra affair, the Gulf War, or any number of other damning parts of his legacy, there seemed to be a concern troll — or several — on Twitter and in the comments section urging civility and restraint in the interest of respectful mourning. Honest reckoning with a person’s impact on the world, it seems, is incompatible with such a goal. It would be nice, I can’t help but think, if this fantasy were true, and we really did have a cultural consensus that all humans are entitled to respect in death. Then perhaps Michael Brown, just seventeen years old and far from a public figure, would not have been described as “no angel” in a national newspaper just days after his murder at the hands of an adult police officer. Sandra Bland might have been spared the constant emphasis on the “marijuana in her system” the same month she was laid to rest. Trayvon Martin’s school suspension record might not have been dredged up one month after he was killed on a trip home from the store to buy Skittles. And given that much of the so-called “grave dancing” has related to Bush’s record in the early years of the AIDS epidemic, it would be impossible not to mention what practically amounted to a cultural consensus in the opposite direction during that time: people who died of AIDS were routinely and systematically denied dignity in death, from the funeral homes that refused to embalm their bodies (or charged exorbitant fees to do so) to the politicians who blamed them for their own suffering (see Bush’s “behavior” comment) to the obituaries and death notices that erased the entire truth of their lives. 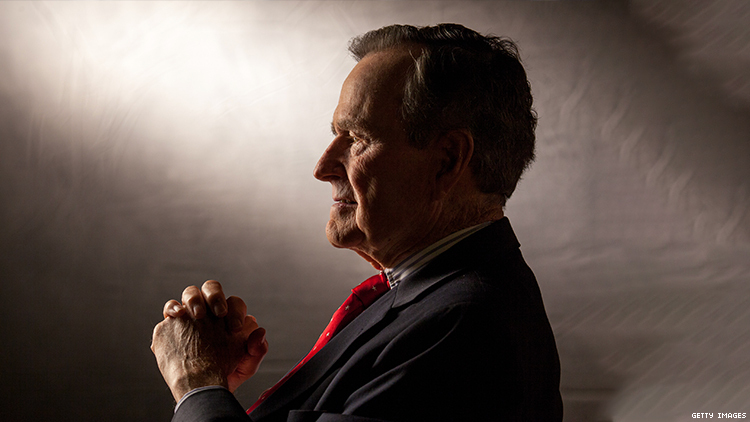 I do not believe in celebrating a person’s death, and I do not celebrate the passing of George H.W. Bush. I know his family must be in pain, and I wish them healing. But we also have a moral and political duty to be honest about the impact a person — particularly the President of one of the most powerful countries in the world — has had on human life. And when the call comes to repress that honesty in the name of some universal right to a respectful mourning period, we should ask: who actually receives that right? It seems clear that in the United States, your right to humanity in death is dependent on the power you held in life. George H.W. Bush understood this. He showed that he knew not all deaths are mourned equally when he failed to act during the first years of an epidemic that has killed some 35 million people to date. We should tell the truth about that.